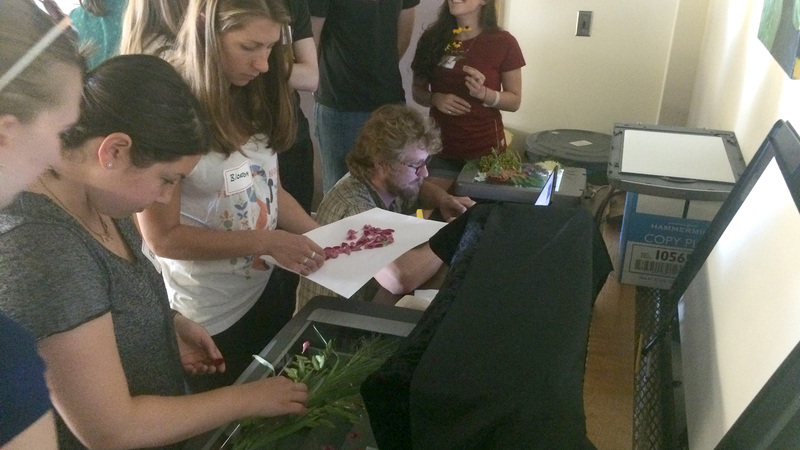 Students in the Art of Horticulture (PLHRT 2010) got a quick introduction on how to create digital botanical art during their class on Tuesday. 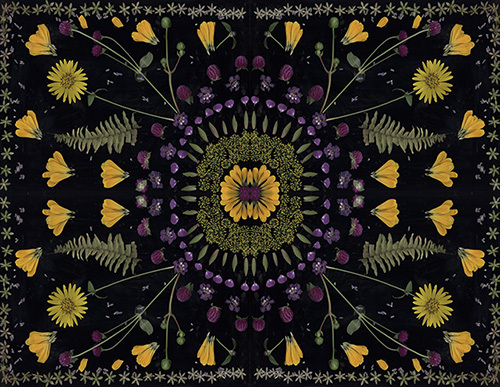 Working in teams, they arranged locally sourced flowers from trials at the Bluegrass Lane Turf and Landscape Research Facility and a local flower farm, Plenty of Posies, on flatbed scanners to capture their form and color in two-dimensional form. … and transfer their arrangements to the scanners. Digital flower mandala. Click image for a closer look. View more examples at the Art of Horticulture website. Students finished up the class applying floral design principles to more traditional arrangements. Mark Bridgen, Horticulture Section professor and director of the Long Island Horticultural Research and Extension Center, will lead an eco tour and natural history workshop to the Galapagos Islands June 1 – 12, 2017. Participants will spend a full 11 days/10 nights aboard the Tip Top IV yacht visiting all of the significant outer islands, allowing for maximum wildlife observations. Each day the yacht travels to a different island during the night while people are sleeping. Then, early in the morning, the small group will go ashore to observe and photograph the unique wildlife — the same types of plants and animals that led Darwin to his Theory of Evolution when he visited in 1835. Every day is different as the group voyages around the archipelago, and every excursion offers new opportunities to experience the natural wonders of the Galápagos. The days are filled with early-morning and late-afternoon outings to catch the peak animal activity, including land iguanas, sea lions, giant tortoises, and countless types of unique birds. There are also one or two snorkeling sessions during the days to observe the coral reefs, sea lions, Galápagos penguins, marine iguanas, sea turtles, hundreds of fish, and much more. There will be the opportunity to kayak several of the days and the evenings are devoted to natural history lectures and stargazing. 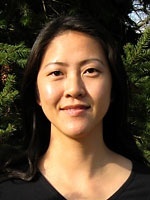 Jenny Kao-Kniffin, assistant professor in the Horticulture Section, kicks off the Fall 2016 Horticulture Section Seminar Series on Monday, August 29, 2016 at 12:20 p.m. in 404 Plant Science Building. She will speak on Modifying plant-biotic interactions in rhizospheres for novel weed management approaches. This and other Horticulture Section seminars are also available via videoconference to A134 Barton in Geneva. View the full fall line-up for the seminar series. Most seminars are also recorded and available online on the Horticulture Section seminar YouTube playlist. Horticulture professor emeritus Marty Petrovic was awarded the 2016 George L. Good Gold Medal of Horticulture by the New York State Nursery and Landscape Association (NYSNLA) at the New York State Fair August 25. 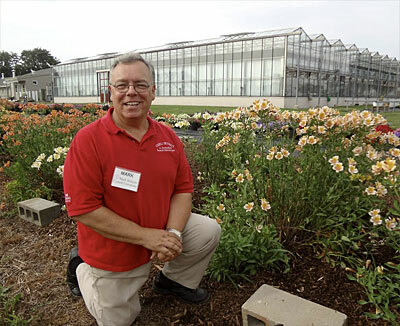 The award is NYSNLA’s highest honor, recognizing an individual who has made outstanding contributions to horticulture in the state of New York. Petrovic, a turf specialist who retired in 2015, is best known for his groundbreaking work on the fate and impacts of pesticides and fertilizers applied to lawns and other turf areas. The Gold Medal Award was renamed to honor George Good after his death in 2008. 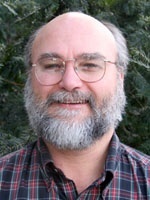 Good spent his entire career at Cornell University’s College of Agriculture and Life Sciences and was an active, engaged member of NYSNLA and received the Gold Medal of Horticulture himself in 1997. Griffiths introduces Kale Day participants to his breeding research trials. More than 30 seed growers, researchers, food industry representatives, consumers and others attended the first Cornell Kale Day at the Homer C. Thompson Research Farm in Freeville, N.Y. August 23. Phillip Griffiths, associate professor in the Horticulture Section, welcomed the group by pointing out the rapid growth in kale’s popularity, but also cautioning that it takes time to develop new varieties with superior agronomic traits and consumer appeal. Griffiths’ efforts to breed new leafy brassicas began in 2008 with a focus on African kale (sukuma wiki). 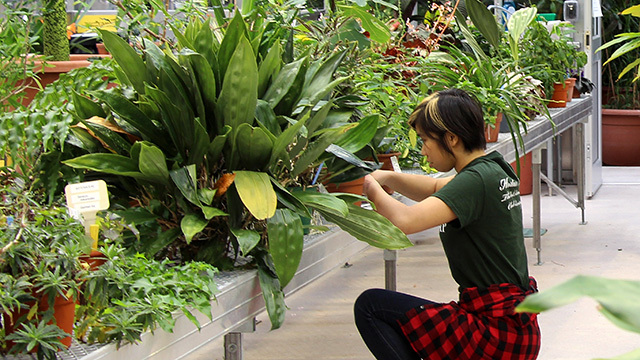 This effort expanded with support from the Atkinson Center for a Sustainable Future, incorporating diverse genetic material from collections maintaining biodiversity. Participants spent most of the afternoon touring Griffiths’ breeding research, including plots featuring currently available varieties and breeding lines in various stages of refinement. 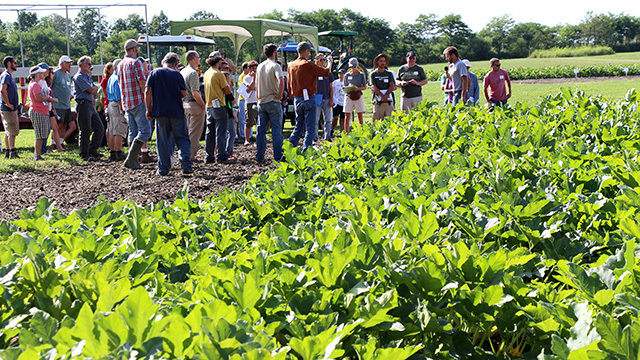 To get feedback from the group, participants were asked to flag their favorite varieties. The feedback will help guide decisions for what hybrids will be used in on-farm trials next summer funded by the New York Farm Viability Institute (NYFVI), says horticulture graduate student Hannah Swegarden, who works with Griffiths. 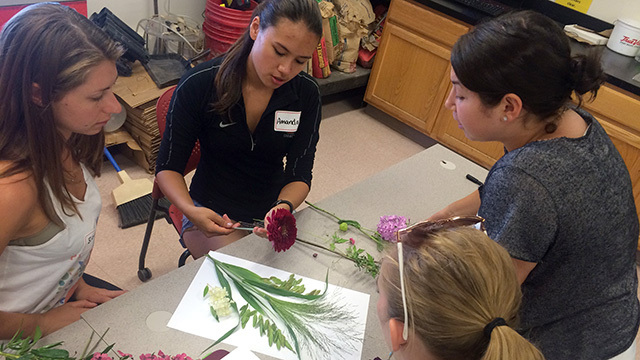 In the brutal, mind-bending world of agronomic combat that is a regional weed Olympiad, Plant Sciences major Patricia Chan ’17 became a legend. Contestants solve real-life farmers’ problems, compete in weed and herbicide identification, and test their skills calibrating sprayers. Winners often get scooped up as prized employees of seed and agricultural companies. 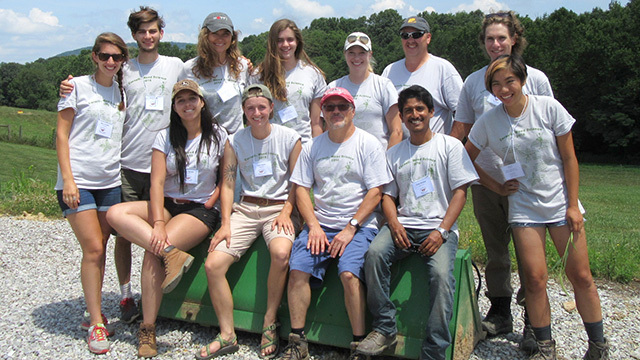 Among the 55 undergraduate and graduate students participating in mid-July at the Northeastern Collegiate Weed Science Society Contest at Blacksburg, Virginia, Chan was the only student to correctly identify the bonus-question weed: Lobelia inflata, or Indian tobacco. 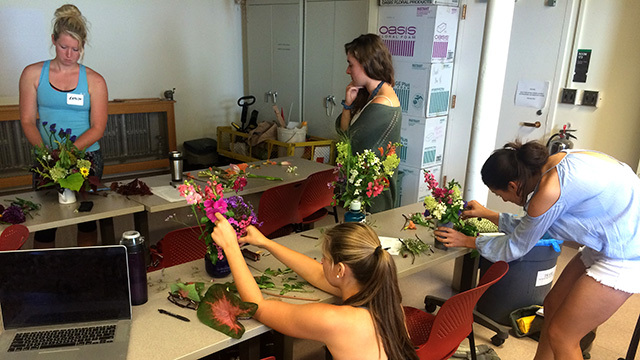 Chan said Davis’ taxonomy course involved a lot of hands-on practice with plant identification at the family level, as she worked in the Liberty Hyde Bailey Conservatory, crop gardens, the university’s weed garden and in the horticulture club’s greenhouse to become familiar with a lot of plants. You can see an example of Chan’s botanical illustration here. 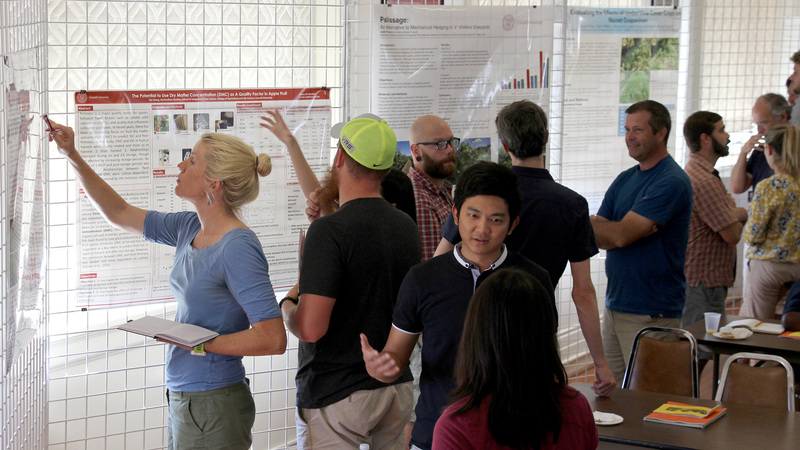 Faculty, graduate students and staff associated with the Graduate Field of Horticulture held their biannual Field of Horticulture Graduate Student Reviews and Field Meeting August 19 in Jordan Hall at the New York State Agricultural Experiment Station (NYSAES), Geneva, N.Y.
Seventeen students and three faculty gave 2-minute/2-slide flash presentations about their research progress, in addition to two longer talks. During breaks, students presented posters providing more details about their work. Horticulture chair Steve Reiners used the occasion to present NYSAES director Susan Brown with the Wilder Award from the American Society for Horticultural Science (ASHS) recognizing the contributions of her apple breeding work to advancements in pomology. Graduate Field of Horticulture, August 19, 2016. 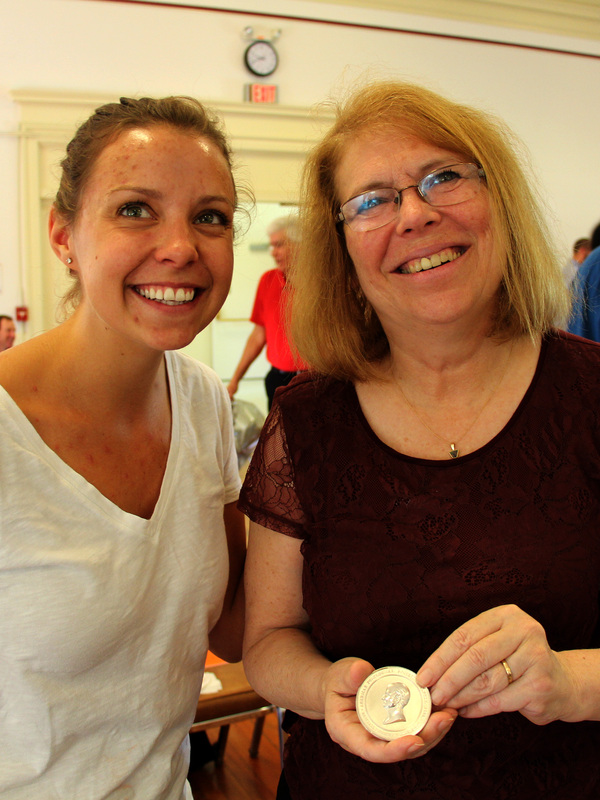 Susan Brown (right) shows her Wilder Award medal to Hannah Swegarden, president of the Society of Horticulture for Graduate Students (SoHo). More than 50 growers, educators and others attended the Reduced Tillage in Organic Vegetables Field Day at Cornell’s Homer C. Thompson Vegetable Research Farm in Freeville, N.Y. August 17. The hay wagon tour include stops on the NOFA-NY certified organic portion of the Thompson Farm to view research on reduced tillage practices on permanent beds, a strip tillage demonstration, and talks on pests, organic soil amendments and soil health. The farm is managed by the Cornell University Agricultural Experiment Station. The event was co-sponsored by NOFA-NY. Research technician Ryan Maher explains his trial evaluating reduced tillage practices on permanent beds. 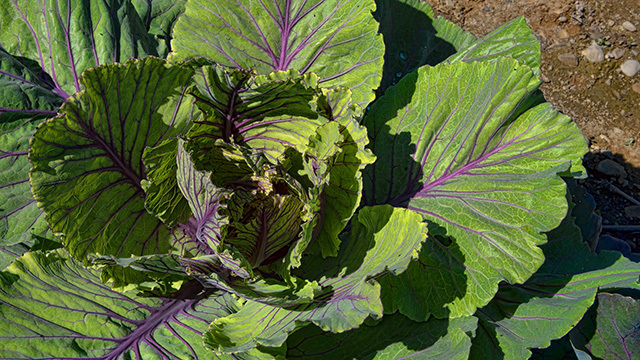 Christy Hoepting, Extension vegetable specialist for the Cornell Vegetable Program, discusses organic management of Swede midge, a growing pest problem in brassica crops. 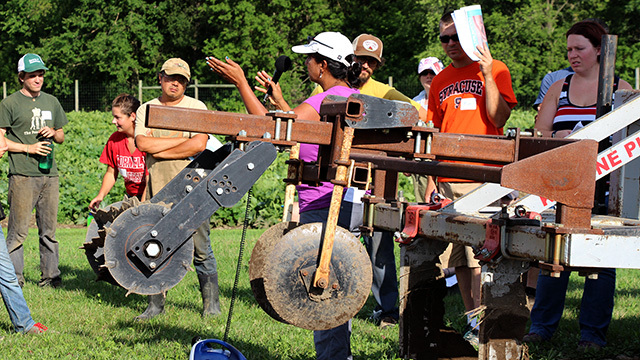 Anusuya Rangarajan, director of the Cornell Small Farms Program, explains features of strip tillage equipment used to limit soil disturbance to the area around the row and break up hardpans that limit rooting. 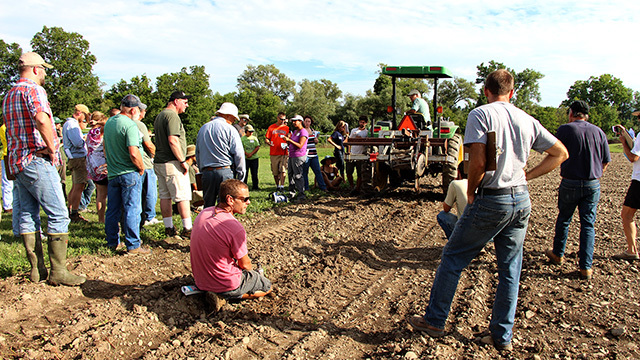 Attendees await strip tillage demo. 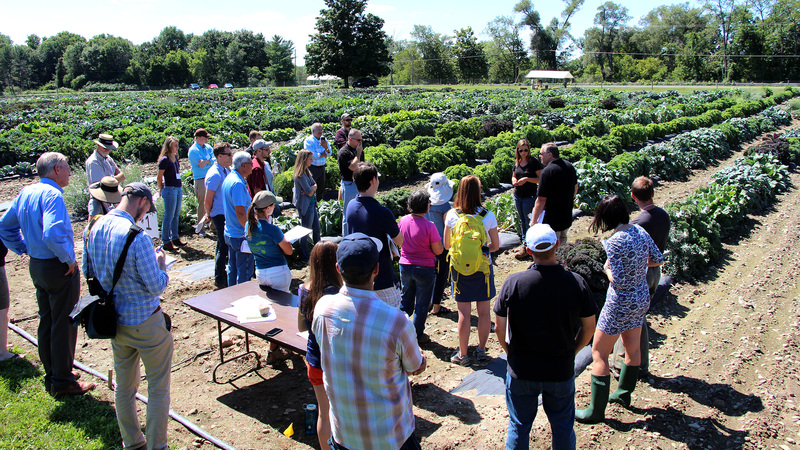 On September 17, the Clonal Collection of Plant Genetic Resources Unit, USDA-ARS, Geneva, NY will host its annual open house from 9:00 a.m. to 11:00 a.m. at the McCarthy Farm, 2865 County Road 6 (Preemption Road), Geneva, NY, 14456 (across from St. Mary’s Cemetery). 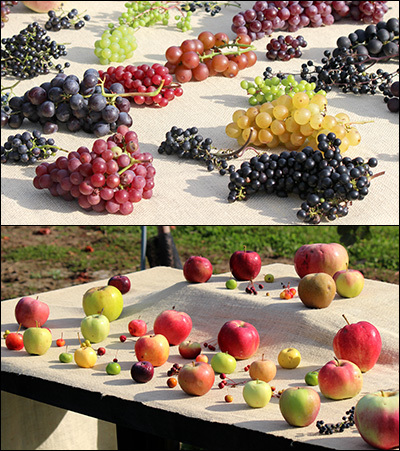 There will be a two hour walking tour on uneven ground through the orchard and vineyard to view the collection — about 10 minutes about the overall collection, 10 minutes about the tart cherry collection, 70 minutes about the apple collection, and 30 minutes about the grape collection. f there is any question, please contact me at c.thomas.chao@ars.usda.gov or at 315-787-2454. We will see you rain or shine on 9/17/2016. 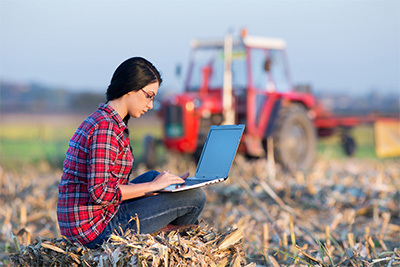 The Cornell Small Farms Program announces open registration for its 2016-2017 season of Small Farm Online Courses building the technical and business skills of farmers. 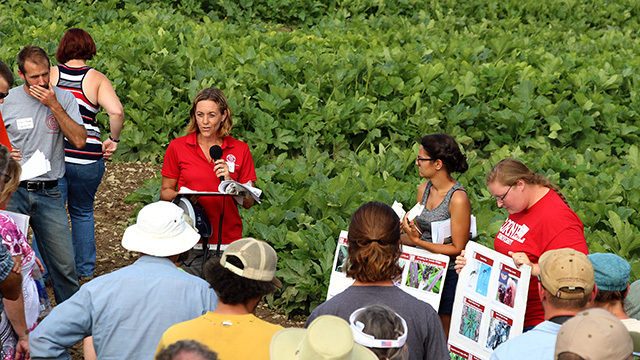 Expert farmers and extension educators guide students through the latest research-based information to help improve efficiency and increase profit on small farms. Are there courses for me? From aspiring to experienced farmers, there is a course for nearly everyone. If you’re just getting started exploring farming as a career, BF 101: Starting at Square One and BF 102: Markets and Profits, were designed with you in mind. For those with at least a few years of farm management experience, check out BF 204: QuickBooks for Farmers and BF 203: Holistic Financial Planning to take your skills to the next level. There’s a handy chart on our course homepage to direct you to the right courses for your experience level. There are more than 20 in all. Each course is $250, which entitles two people from a farm to attend. Discounts for early sign up and multiple course sign ups are available. Check out the listings below for more information on a particular course and the instructors. Visit our Frequently Asked Questions page to learn more about registration, payment, and computer requirements. Register now. The first courses start September 26. Questions? Contact Erica Frenay, ejf5@cornell.edu or Steve Gabriel, sfg53@cornell.edu or call 607 255 2142.